I was in The United States of L.A. at a friend’s home when I had a crazy idea. “Cans or bottles!” I exclaimed to Tim as I raised my head out of the refrigerator. Tim stared back at me, not really sure how to respond. He smiled back. Another one of my crazy ideas. Sign up for the email list: Sign me up! Does canned beer taste better? 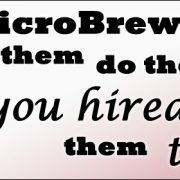 When I ask the MicroBrewr Podcast guests whether they prefer cans or bottles, surprisingly, not many talk about the flavor of the beer inside. There are emotional answers, just that they prefer one to the other. Lots of respondents say that cans protect the beer better. Not many mention flavor. If it’s true that the can protects the beer better, then I should find that canned beer tastes better than bottled beer. I wanted to know for myself. I was so curious that I recently did a couple of blind taste tests to see if there really is a difference between beer packaged in cans, versus beer packaged in bottles. I did blind taste tests with 2 sets of friends. The first time, we knew it was a “cans versus bottles” test. We had the same beer, side-by-side, one from a bottle, the other from a can. We were trying to evaluate the beer and trying to see whether we could determine which came from the can and which came from the bottle. The second time, my friends didn’t know anything about the packaging. I told them that they had 2 different beers of the same style. I asked them to describe the differences between the two and tell me which they liked more. For the first experiment, we used 3 different beers. Tim and I chose beer styles on the milder side. A really strong flavored beer would potentially mask any differences imparted by the packaging. 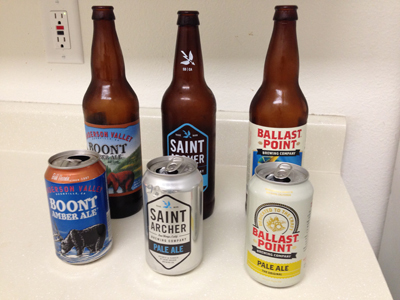 Taste test one: Anderson Valley Boont Amber Ale, Saint Archer Pale Ale, Ballast Point Pale Ale. Tim’s passion and his expertise are in wine. His apartment has more wine glasses than beer glasses. So we compared each of the beers in wine glasses. One marked with a charm, the other not. The objective was to taste each beer side-by-side. It was a blind tasting, so we didn’t know which was which. We were to describe the beer to discern whether there were any differences. Then we had to guess which came from the can and which came from the bottle. Tim poured for Sebastian and I. Then I poured for Tim. First up was the Boont Amber Ale from Anderson Valley Brewing Company. Now, let me say that I entered this whole exercise with a bias toward bottles. 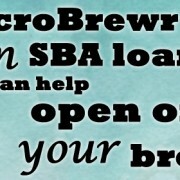 Call me old-fashioned—and my bias is diminishing, especially after hearing from so many can advocates on MicroBrewr Podcast—but I prefer bottles. So for our first test, without knowing which was which, I picked the charm as being from the bottle. I liked that one better, so I assumed it was the bottled beer. In fact, it was the canned beer. Sebastian also preferred the canned beer. Upon tasting the one with the charm, he immediately exclaimed, “I love this one. This is it.” He tasted again and said that all the flavors work together in the canned beer. In the end, Tim liked the bottled beer better. However, he incorrectly picked this one as the canned beer. Coincidentally, I marked his with the charm the same as he did for Sebastian and I. He said the one without the charm had “far more carbonation and flavor.” So he thought it was the canned beer because when he opens a can of his favorite American macro lager, it always has a lot of carbonation and foam. Even on the first beer in the test, we were all surprised how different the beers were in aroma and flavor, but sometimes even in appearance. Tim said the flavors in the canned beer were muted, it had less flavor overall. “You can’t get a lot of malty good juiciness,” he said. Like Tim and I, Sebastian said the bottled beer had a “sharp” flavor. He further described it as “GMO.” I don’t think he meant it literally, but just as a general criticism, perhaps a vague notion of something lacking. Although he did say that the bouquet came out more in this beer. I felt the canned beer was lighter in color, had more flavor, and the malts were more pronounced. The bottled beer had a sharp flavor and I wondered whether it was a metallic flavor. Yet overall, the bottled beer had less flavor. To recap: All three of us guessed incorrectly. Sebastian and I preferred the canned beer, while Tim preferred the bottled beer. It was interesting that Tim felt the bottled beer had more flavor, but I felt it had less flavor. We all agreed that the “sharp” flavor in this beer was absent or less intense in the canned beer. During the process, Tim and I each recognized that our own pre-existing preferences—mine for bottled beer and his for canned beer—were affecting our preference during the test and affecting our choice about which was from the can and which was from the bottle. Second was the Pale Ale from Saint Archer Brewing Company. Before we knew which was from the can and from the bottle, I preferred the beer with the charm, so I again picked this one as the bottled beer. This time, I was correct! Sebastian said the one without the charm had a “weird metallic funk to it.” He should have agreed with his initial perception; he eventually picked this one as the bottled beer, but it was the canned beer. Tim preferred the canned beer. He said it was more crisp and more flavorful. Tim and I each perceived a definite difference between the two. But in different ways. Overall, I felt the bottled beer had more flavor. In the bottled beer, I sensed aromas of crayons that were not present in the canned beer. I also sensed distinctly more intense flavors of orange peels and hops in the bottled beer. At first Sebastian could tell a difference, but then he couldn’t. Maybe his taste buds were getting tired from this Pale Ale that seems to me more like an India Pale Ale. To recap: Tim and I each guessed correctly, but nearly opposite. I liked the bottled beer better, saying it was more flavorful. Tim liked the canned beer better saying it had more intense flavors. Sebastian guessed incorrectly, but I think he would have got it right if he had stuck with his initial reaction. At first, he was sure the canned beer had a weird “metallic” flavor and aroma and he preferred the bottled beer. After a while, he couldn’t tell a difference. He tasted back-and-forth several times until he was thoroughly confused. With this round, Sebastian decided that he really likes Amber Ales. He asked to have more of the first beer, the Boont Amber Ale. Alas, this is science—we must continue the study! Lastly, we tried Pale Ale The Original from Ballast Point Brewing Company. Perhaps this sampling had the greater difference between the canned beer and the bottled beer. I preferred the canned beer over the bottled beer. While I felt that the aroma from the canned beer had hints of oil-based paint and the flavor was like orange (the color, not the fruit), I felt the canned beer had a crisp, sharper taste. It just tasted cleaner, better. Whereas the bottled beer had less aroma, less flavor, and tasted kind of funky. Sebastian preferred the bottled beer, which he felt had a nice citrus aroma. He said the canned beer smelled like pee and smelled like wet hay. He said the canned beer tasted more mellow, less pronounced than the other. Tim, on the other hand, said there was “not a huge discernible difference in flavor [between the two].” Upon further investigation, he noted that the bottled beer had more popping floral aromas, while the aromas and flavors of the canned beer were muted. He ultimately preferred the bottled beer over the canned beer. To recap: All 3 of us guessed incorrectly about which came from the can versus the bottle. I liked the canned beer better. If pee smell is undesirable in beer, then Sebastian preferred the bottled beer, as did Tim. After the first taste test, I realized it was too complicated, we should simplify it a bit. Huffington Post published in 2012 a very simple test with interesting results. Check it out here. Tim suggested a good idea: Do the test again with new participants, but don’t tell them anything about cans versus bottles. Five days later, I caught my friends Jon and Kelly in Santa Cruz, California. For each style, Jon and Kelly believed that they had 2 different beers side-by-side. Their instructions were to describe each beer and tell me which they preferred. 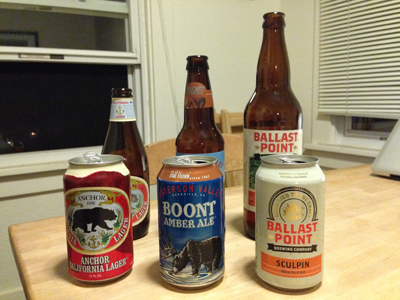 Taste test two: Anchor Brewing Anchor California Lager, Anderson Valley Boont Amber Ale, Ballast Point Sculpin IPA. Jon and Kelly are each teachers. Kelly felt it would be prudent to have a rubric with which to judge the beers. They are a new couple, having been dating for a couple months. Jon has been homebrewing for a couple of years. Perhaps Kelly’s rubric was secretly intended to mask her intimidation. I didn’t participate in the second tasting because I already knew what the selection was. In truth, by the time we got to my turn we were kind of tipsy. The previous beers had warmed up a bit. Jon threw in a bunch of different beers from his fridge. Kelly had trouble keeping up with the notes. It was kind of comical. Not at all scientific. The first blind taste test was Anchor California Lager from Anchor Brewing. I didn’t tell Jon or Kelly what they had tasted until they were done with all 3 beers. Jon carefully studied the two before deciding that he definitely preferred the bottled beer. Kelly also much preferred the bottled beer. Like in the previous test with my other friends, Jon and Kelly noticed a definite difference from the canned beer to the bottled beer. Jon described the canned beer as light, not heavy carbonation, smooth, watery. He said it had a light tint of malt flavor and more aftertaste than most lagers. Then he tried the bottled beer from the glass. “Woah,” he said certainly, “this one is better.” He said that the bottled beer had much more body, more carbonation, and less nose. He said it was more typical of lagers in its lack of aftertaste. Kelly described the canned beer as a backyard, afternoon barbecue beer. She said it was light in color. It had more head to begin with, but then it felt flat in her mouth. “It’s okay,” she said, reflecting on what she felt was a really strong front-taste. In the bottled beer, she felt that the aroma was much less strong. She noted that the carbonation remained much more intact. It started off with less foam, but still felt more carbonated. She said the aftertaste was stronger than the front-taste. “I don’t think I would drink that one again,” Kelly pointed to the other glass with the canned beer. To recap: Jon and Kelly both liked the bottled beer more than the canned beer. Second for Jon and Kelly was the first for Sebastian, Tim and I: Boont Amber Ale from Anderson Valley Brewing Company. Again, there were differences between the two. Jon said the bottled beer had a little bit of a malty flavor, whereas the canned beer had a sweet flavor, but not the malty sweet. Kelly again noticed that the head of the canned beer decreased rapidly compared to the bottled beer. She described the canned beer as having more of a licorice aftertaste that the bottled beer did not have. Kelly noted that the bottled beer was clearer in appearance and the foam persisted more. Kelly said the bottled beer had less flavor, but more carbonation. It had a weird aftertaste that the canned beer did not have. To recap: Both Jon and Kelly preferred the canned beer. Last of all, was the Sculpin India Pale Ale from Ballast Point Brewing Company. Kelly preferred the canned beer quite a bit more than the bottled beer. Jon and Kelly both noted that the bottled beer appeared cloudier than the canned beer. Kelly also noticed that the canned beer had thinner foam than the bottled beer. To recap: They both preferred the canned beer. Two out of 3 participants preferred bottles to cans, 2 out of 3 times. Two out of 3 beers tasted better in the bottle than in the can, 2 out of 3 times. Overall, bottles had 5 votes and cans had 4, just a 1-vote margin! Both participants preferred cans to bottles, 2 out of 3 times. Two out of 3 beers tasted better in the can than in the bottle, 2 out of 3 times. Overall, cans had 4 votes and bottles had 2—twice as many for cans! It would have been good to see whether a third person could have thrown off the dominance of the can. If I had voted opposite of Jon and Kelly, it would have made it more even, like the first taste test, but reversed. Overall, cans would have had 5 votes and bottles would have had 4. 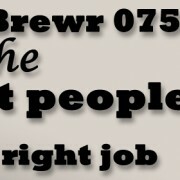 None of us are BJCP-certified beer judges, we’re all just beer drinkers. 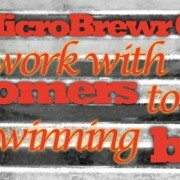 We represent the average beer drinker, spanning a range from occasional beer drinker to passionate homebrewer. UPDATE (1/10/2017): I have since become a Certified Beer Server. I published all of my study notes on BeerExamSchool.com. 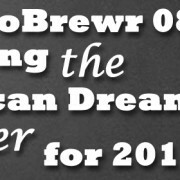 If you want to get a job in the craft beer industry, if you want to better evaluate beers, or if you just want to learn more about this amazing beverage, check it out! We have no way to know the shipping climate for any of the beers we sampled. Some could have been in a climate-controlled container all the way from the brewery to the retail outlet. Others might’ve travelled in an uncooled trailer through California’s scorching San Joaquin Valley. I didn’t check a shipping date or packaging date between the canned beer and bottled beer. One might’ve been older than the other. With the exception of my tour of Anchor Brewing, we’ve never seen the breweries. And if we had, we have no way of knowing whether the canning line had recently been cleaned, or if it had been a while for the bottling line. Additionally, after Jon learned that he was drinking the same beers side-by-side in all 3 rounds, he pointed out that all of the bottled beers that I served were in short glasses, compared to tall glasses for all of the canned beers. This is certainly the reason that Jon and Kelly each noticed less aroma from the bottled beers. And we never touched a draft beer in this study. Here’s an interesting thing. After I tasted all of my beers and learned the results, I admitted that I am biased toward glass bottles. To my knowledge, aluminum beverage cans are lined with a thin plastic film to prevent corrosion. I don’t trust plastic. Maybe it’s rational, maybe not, call me paranoid, I’ve read a lot about it. It is a bias, it’s my opinion. It affects my perception even when I don’t realize it. The point is, whichever beer it was that I liked more in each taste test, I guessed that was the one from the glass bottle. Yet based on the beer alone, I preferred the canned beer 2 out of 3 times. Sebastian was also biased toward bottles, he didn’t like cans at first. His preferences confirmed his bias—he liked the bottled beer 2 out of 3 times. Tim claimed to be unbiased, but he previously thought that canned beer was always more carbonated. Yet he found out that to be not always true. These are the sorts of biases that affect a customer’s decision to buy a beer in one packaging over another. 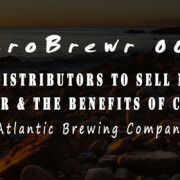 Often these are the biases that also affect a brewery owner’s decision to put their product in a can versus a bottle. Ultimately, this taste test confirmed that sometimes customers prefer the taste of bottled beer, sometimes they prefer canned beer. The packaging doesn’t affect the customer’s perception of the product. While the packaging does affect the customers decision to purchase the product, those biases are being broken. So use whatever you think works best for your business plan and your marketing plan. 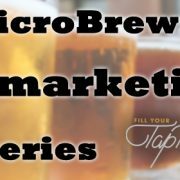 And if you want further reading about the industry’s perception, check out The Session 98. and this recent post recapping the survey from guests on MicroBrewr Podcast. Don’t miss other great posts like this one. – I really thing using the same glassware is very important, so that’s one thing I would change. – It’s pretty hard to get the bottle dates for some beers, so I would restrict to buying clearly marked brands if possible to make the test even better. Thanks, Scott. Yes, share a link to your post. Thanks! I’d be interested to see how this works using a triangle test instead of direct head to head. This would prevent any bias or precieved bais from impacting the actual test. Yeah, thats a great idea, Aaron. That was the idea of the second round of taste tests, when I told Jon and Kelly nothing about cans vs. bottles. You going to try a test, too? You noted this in the limitations section. But I think the biggest factor is beer age. Ideally you would have beers packaged on the same day, or within a week. I have a bias towards cans. Usually because it is easier to find the date stamp on the bottom of the can, rather than scan over an amber bottle with a light dotted smeared date statmp. Thanks for your thoughts, Andrew. That’s a good point: It’s simply easier to see that date stamp on a can.